Edited by John545, 17 September 2018 - 12:18. I don't think it is a defect for the grey stripes not to be uniform. If the fine nib is too fine and dry for you, it does make sense to try to exchange the pen for one with a medium nib. Did you check the nib in a loupe? I've purchased a dozen new Pelikans and its not unusual for them to need minor tweaks out of the box. Make sure the tines are aligned and that the gap is correct. A Pelikan fine tends to write pretty wet and wide from my experience. I've got an 805 Stresman due to be delivered from Cult Pens today! If you are unhappy you should probably send it back for an exchange. Pelikan nibs do tend to be a little broader than eastern nibs. This one may just need a good cleaning out or some usage. The only modern Pelikan nibs that have any spring are on the M1000 series. As to the stripes, this is not that unusual to see them not perfect but it it bothers you then I would send it back and ask them to check the one they send you back for uniform stripes. At this price, I'm not comfortable making any adjustments to the nib. It's just too risky as I could end up making the issue worse and then not being able to get a refund. The issue may be that the gap between the tines is too small, it just writes way too dry. I hope you have a better experience than me! Out of curiosity, which nib size have you gone with? I've got on to cultpens and explained the situation. They said if I send it back they will refund the order, but they will only refund the postage if a "fault is confirmed". This sounds questionable to me seeing as the issues I've had may not necessarily be deemed to be a fault. Life is short. You are not happy. Send it back and forgo the shipping cost if that is the decision. It's pretty common to charge the postage on the return if there's no actual defect and you just aren't happy with it because of your own expectations. If the flow seems too light, I would flush the pen very well with water or a pen flush and make sure it's clean and try again. The nib can easily be fixed. I've had to make adjustments to almost every pen I've bought, and that includes about a half dozen Pelikans. Its not that there is anything "defective" with them, I just like zero feedback and a glassy smooth writing experience. They usually come with a bit of feedback, so I smooth them. You can learn to do your own nib adjustments, but if you aren't interested in that, you will have two options for now: send the pen back and get another, or contact Pelikan for their nib exchange program and get a medium. Also, the binde (that's the part with the stripes on it) on all Pelikans is a flat sheet that is rolled and mated to the pens individually. Every Pelikan with a striped binde that I have held in my hand had a noticeable "seam" where the binde comes together. Sometimes the lines line up quite well and the seam falls into the dark area and is less visible, but I've always been able to see the seam if I just casually roll the pen in my fingers looking for it. It can be harder to see in pictures, but in hand, I can always spot it. If that bothers you, get a solid colored Pelikan, because a very high percentage of striped Pelikans will have a noticeable seam on their binde. Edited by sirgilbert357, 17 September 2018 - 15:04. Ah - if you don't want to tweak the nib then by all means - send it back - even if you have to eat the shipping cost. Life is too short! I got an extra fine nib on mine - they tend to be just right (more like a Western fine) for me. Also - as noted - the Pelikan gold nibs tend to be pretty stiff with the exception of the M1000 nib which is big and bouncy. Edited by TheRealMikeDr, 17 September 2018 - 15:20. Don't live with regrets, send the pen back for a refund. The Pelikan you just sent back is known for being a wet writer, and their nibs are made in house, with each gold nib being written-in by hand and getting a final inspection before going out the door. You just happened to get one that maybe wasn't optimal or wasn't to your liking. I prefer wet, smooth nibs too and I would encourage you to just order the same pen again in medium nib if you are really in love with the looks of it. Odds are you will be delighted with the next one (unless the binde seam issue is insurmountable). Barring that, you could order from Nibs.com, they will customize any nib to your liking and ensure it's writing the way you want before they ship it. If you don't care to dabble in nib tuning and want a guaranteed perfect nib out of the box, then you'll be happy with what they provide. You pay a premium for it, but some consider it worth it. EDIT: and keep in mind, if you are writing on sub par paper, no nib is going to perform as well as it should. The trifecta of nib/ink/paper is very important to the overall writing feel/experience. Edited by sirgilbert357, 17 September 2018 - 16:52. Exactly. Price does not equal writing performance. I have a Wing Sung 3008 I paid less than 8 bucks for that is super smooth and has excellent flow with every ink I've tried in it. I've actually never heard of that pen before, and it looks pretty good! Just exchange the same pen as a M and you should be happy. Like you, I read that Pelikan pens tend to write wide for western nibs, but mine didn't get the memo. 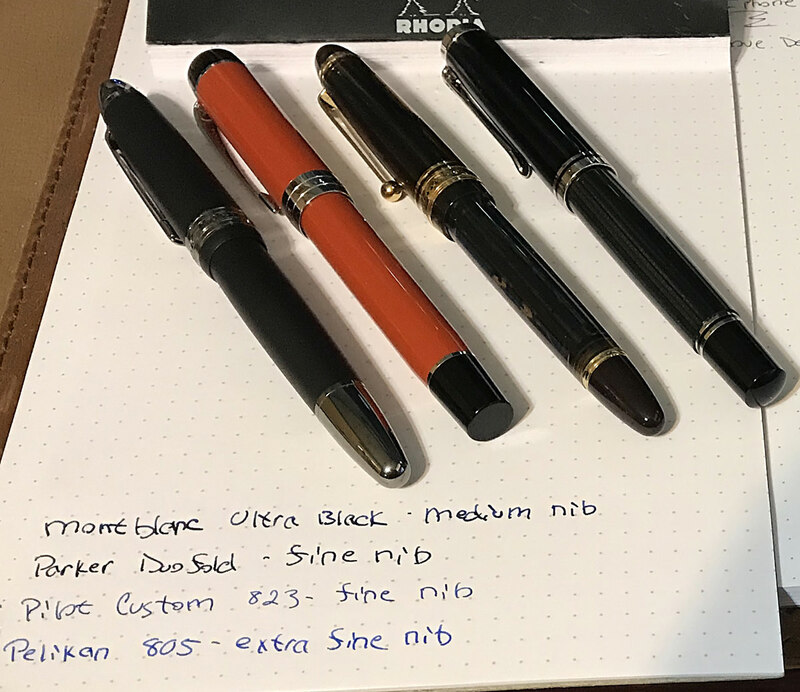 I love my Pelikan's in M and B. If you didn't like the size and balance of the m805 then you should move on to a different brand, but if everything was good other then the F nib it would be worth trying the M.